Last week, I blogged about where to find boiled crawfish outside of South Louisiana. If you happen to be the friend or relative of a Cajun, you just might find yourself at a crawfish boil and feel a bit out of place. 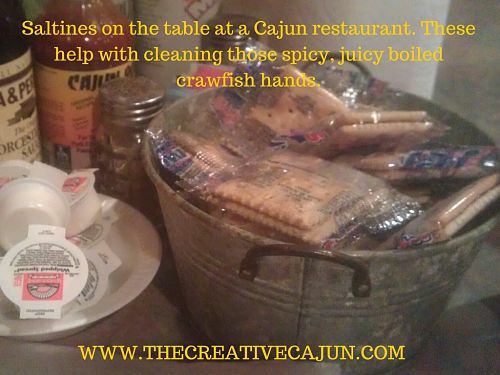 This post is meant to prepare you for what to expect, how to dress and how best to wash your hands after peeling boiled crawfish. #1: Wear dark colored clothes that are nice enough to wear in public, but aren’t nice enough that if they were ruined, you’d be devastated. Peeling boiled crawfish can get messy and the occassional piece of juicy, tasty crawfish fat will drip on your shirt and that stuff STAINS. It’s best to wear a dark colored shirt and choose a pair of jeans that are comfortable and darkly colored. Don’t even THINK of bringing or wearing a silly plastic bib. People just don’t do that at crawfish boils. Trust me. #2: If you have long hair, plan for a secure way to put your hair up (or bring a baseball cap). There’s nothing more frustrating than having spicy, juicy crawfish hands and having your hair in your face. Your hands are a mess and you can’t even help yourself – talk about a sad state of affairs. Before the crawfish are served, put your hair up in the most secure manner. You’ll thank me later, I promise. #3: Remove any rings and/or nice watches before the crawfish are served. Just like #2 – if you wait until you’re mid-crawfish eatin’ – you’re going to regret not removing your rings & nice watch. 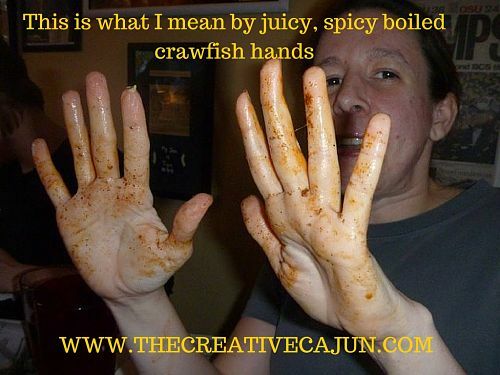 It’ll be too late – your hands will already be a spicy, juicy mess with crawfish juice dripping down your arm. Do this before the crawfish arrive and you’ll be thankful you stowed your valuables in a safe, clean spot. You can put them back on once you’re done eating. #4: How to wash those juicy + spicy crawfishy hands. If you happen to be at a restaurant that has Saltine crackers on the table – take advantage of this! Open a packet and crumble them between your hands. They will soak up all of the juice and help to remove the spicy juice from the boiled crawfish. Fresh lemon may also help remove the scent of the boiled crawfish from your hands, if you happen to have some fresh lemon, give that a try. Then head to the restroom and wash a few times with soap + water. When you get home, use a nail brush to get under your fingernails, too. Trust me on this one – if you don’t do this and you rub your eyes the next day, you’ll regret it! That crawfish boil spice will come back to haunt you. #5: Don’t plan an outing afterward without appropriate time to go home, shower and completely change clothes. Eating boiled crawfish tends to make you smell a bit like…um, crawfish – and that’s not the most pleasant smell to most people. I love boiled crawfish as much as life itself, but that doesn’t mean I want to walk around smelling like I just came from a crawfish boil. Chances are, if you are attending a crawfish boil, you’ll be there for the majority of the day and you’ll have so much fun that you won’t have the time or energy to go out afterward. But if you do – be sure you have enough time to go home, shower AND change your outfit before your next outing. Trust me on this one – the smell will be in your clothes, your hair. You’ll have had crawfish juice dripping down your arm. It is an amazing culinary experience that was described in the book “Bayou Farewell” as “shrimp meat and lobster meat making love” – crawfish is incredibly delicious and boiled crawfish is the most delicious way to eat those tasty little mud bugs. Yes, it’s worth the hassle. 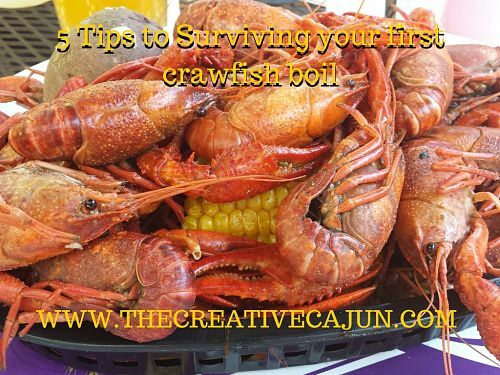 I hope these tips better prepare you for attending your first crawfish boil and didn’t scare you away. Once you get the jist of peeling those bright red little mudbugs, you’ll be hooked, too. Thanks for this! I wear a watch where ever I go, and I usually eat with it on! But, I am sure glad you reminded me of this. I am gonna have craw fish for the first time soon, and I want to do it right!